Went out to Lake Fork at the direction of a friend from the TFF. Had a good time. Fished under a bridge and caught a male bowfin! The Hispanic family next to me, fishing with minnows, caught 5 or 6 and proceeded to kill the first 3 until I intervened and instructed them that it was unnecessary and that they wouldn't eat all the crappie (they were doing that themselves). On their stringer they had a number of really nice crappie, both black and white, a number of undersized ones, and around a dozen bass, the largest being around 6 lbs. 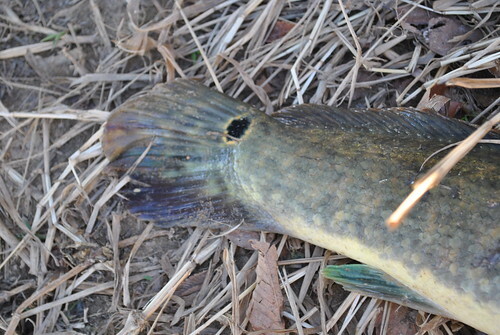 The male I caught, Illustrating the males tail spot and green fins. Wouldn't want to get a giner in there! First let me say that I really like your blog. I have added to my blogroll. This is the first time that I've seen a bowfin. It looks interesting. It's a shame that some folks feel the need to kill them. What sort of flies do they like? They generally go for crawdad, sculpin or minnow immitations. General streamers. 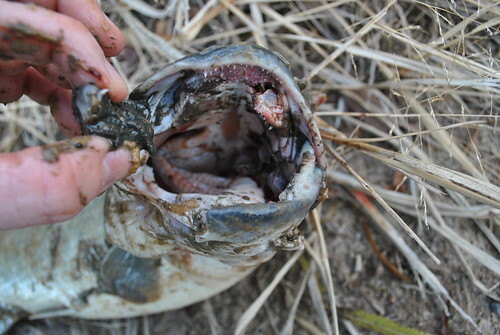 If sight fishing, something you can get in front of them with a big sharp hook. very tough mouths. Almost need to strip strike like with a tarpon. Will sometimes spit the fly, but will usually attack again if you recast it in their face. I have been using tyger wire leaders, but you could probably get by with some 20-30lb fluorocarbon. I actually think that might be superior. Learn their life cycle and they can be pretty easy to find. They have a very wide distrobution. 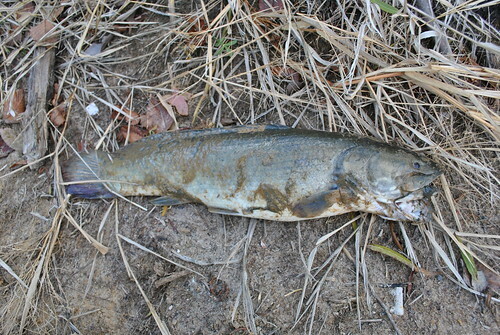 Bowfin are awesome fish... living fossils. I have yet to catch on one the fly, but maybe one day I'll be in the right place at the right time with the right fly. Very cool. Way to step in and protect the wildlife. 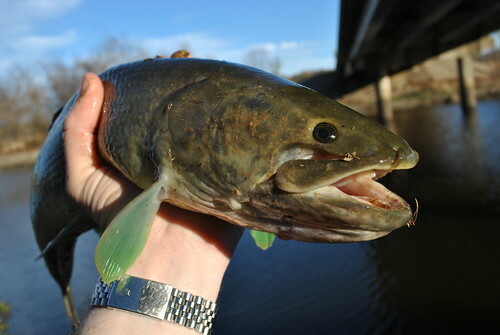 Bowfin are such cool fish. I'm still waiting to catch my frist bowfin. Nice job. Did you catch this near Raleigh?